Home / Ace • Fanboying! • TTM Tuesday! / TTM Tuesday! The Scoop On Who Is Signing On Broadway! Zachary Quinto! Zachary Levi! Daniel Craig! When it comes to TTM collecting everyone always wants to know, Are they signing? Should I send something? Etc… And while there’s no crystal ball that has answers for everyone, Ace and I wanted to give people a good indication! Especially because there are so so many good people on Broadway right now. Check out Ace’s recap after the jump! What’s up autograph fanatics! Ace here with TTM Tuesday! We have the stats that will help you decide whether or not it’s worth the risk. While there are some celebrities who sign after the play is done, Ex: Jesse Eisenberg, most celebrities who do not sign during the span of the production, usually just don’t sign on broadway. There are several reasons for this: the venue doesn’t pass on fanmail or the celebrity doesn’t read fanmail. 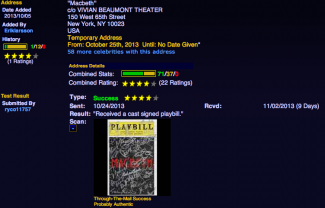 Hopefully with some of these stats, all you broadway fanmail fanatics can easily send away! Before you jump right in, let me just explain a few things… Those lines along with the number indicated by green indicate a success while those indicated by the color yellow, show you those that are still pending. Any that are indicated in Red highlights a Return to Sender. We want to send a special thanks to www.startiger.com for the charts and the information. If you’re looking for TTM info we highly recommend checking them out! While there still might be a chance with Hill and Stewart, it seems like the others are most likely not signing during this broadway run. Stewart and Hill have been known to answer broadway fanmail in the past, AND it is really early in production, so there is still a chance they might do it. Bloom and Hawke have historically been known not to sign at all or let an agency send out preprints… Parker is still up in the air, cross your fingers. Please let us know your thoughts! We would love to hear them! Remember, do your research! TTM Tues! Celebrities Signing Their Fanmail Photo Gallery! With President Barack Obama! Dana Delany! Nikki Reed! Valerie Harper! Victoria Justice! Autographs! And More!